This comprehensive, compact, lucid, and faithful account of the Buddha's teachings persistently enjoys great popularity in colleges, universities, and theological schools both here and abroad. "An exposition of Buddhism conceived in a resolutely modern spirit." --from the Foreword. "For years," says the Journal of the Buddhist Society, "the newcomer to Buddhism has lacked a simple and reliable introduction to the complexities of the subject. Dr. Rahula's What the Buddha Taught fills the need as only could be done by one having a firm grasp of the vast material to be sifted. It is a model of what a book should be that is addressed first of all to 'the educated and intelligent reader.' Authoritative and clear, logical and sober, this study is as comprehensive as it is masterly." 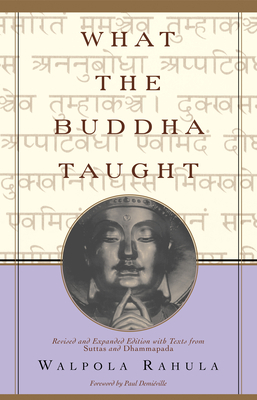 A classic introductory book to Buddhism, What the Buddha Taught, contains a selection of illustrative texts from the original Pali texts, including the Suttas and the Dhammapada (specially translated by the author), sixteen illustrations, and a bibliography, glossary, and index.